The 52nd Brazilian Karting Championship ended last Saturday, July 22nd. Organized by Confederação Brasileira de Automobilismo – CBA, the dispute lasted 13 days at Kartódromo Beto Carrero, in Penha, Santa Catarina coastal state. More than a registration record, what the numbers show us is the strength of motorsports grassroots. The greatest karting competition in history started on July 10th with the first phase. Having its activities till the 15th, this first stage had races for 10 categories and gathered 284 competitors. In the following week, between 17th and 22nd, nine more classes took to the track. With 236 participants, those groups revealed their champions and, above all, finished a very tight racing cycle. This competitivity showed the high technical level of our drivers and, also, CNK (National Karting Commission) organizational capability. CBA department responsible for the modality has managed the event in a calm and professional way from the setting up of the whole structure to the drivers’ celebration on the podium. Although they had received 565 registrations, 522 drivers actually took part in it. Out of those, only 3 were not Brazilians: one from Argentina and two from Bolivia. That way, these 519 drivers represented 20 states located in 5 different Brazilian regions. 15.000 people were present at the event at Kartodromo Beto Carrero. In order to attend to the public in the audience, as well as on the track, there were 4 ambulances, 2 ambulatories, an advanced medical post and a Military Police helicopter (Eagle type) available. More than 10 health professionals took part in the operation, which more than anything, offered security and tranquility to everybody. Still talking about infrastructure, it must be mentioned that 25 technical and sportive stewards and marshalls from CBA, FAUESC* and KCP** offitiated the competition. Moreover, a total of 60 people worked incessantly to take care of all needs, be them of security, maintenance, administrative, janitorial or track nature. 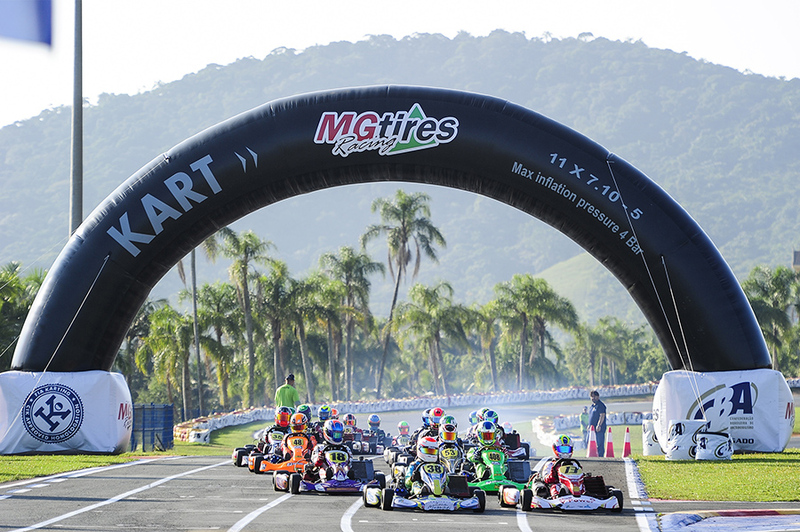 Services and products demand, both related to track activities and/or individual needs, were also impressive during this Brazilian Karting Championship. In terms of logistics, 1.200 rooms were booked at local hotels in Penha, Navegantes, Itajaí and Balneário Camboriú. Plus, 100 apartments and /or houses were rented in Penha. At the race track 20.000 liters of gasoline were consumed. MG Tyres, the event’s exclusive supplier, has sold a total of 8.800 units. Nine different kart brands were used in the competition: Birel ART, Bravar, CRG, Energy, Mega, Mini, Techspeed, Thunder and Tony. Five different motors: Honda, IAME, KTT, Riomar and TM. Such a grand competition couldn’t award prizes of less importance. So CBA and its commercial partners did their best to offer very attractive benefits in several categories which reached the mark of approximately US$ 200K. Sudam category offered the driver Lucas Okada, as a prize, free participation in the 2018 season of F3 Academy, recent modality focused on new drivers education. This award aims at motivating young drivers to pursue a carreer in motorsports leading them to take that second step towards the auto circuit. At “Mirim” level, two new Rookie Bravar karts with Honda GX-160 motors were given away to Gabriel Koenigkan and Heitor Dall’Agnol. Additionally, two Mini karts with IAME motors were presented to Antonella Bassani and Lucas Mendes from the “Cadete” category. To the “Sprint Race” category, one of the most sought after categories for those looking to advance their carrers into touring classes, a valuable prize was also offered. The champions of “Senior A” and “Graduated” classes, Alain Sisdelli and Pedro Goulart respectively, will take part for free, as a duo, in an official race of the current season. Finally, 100 trophies and 600 participation medals were made to be given away on and out of the podium. One of the greatest innovations of the 52nd Brazilian Karting Championship was its live transmission by the sports channel with the largest audience in Brazil – SPORTV. Altogether, there were 4 uninterrupted hours of transmission, being it 2 hours on the first stage and 2 more hours on the second one. According to the numbers provided by Ibope, around 1 million spectators watched the races. Using a common formula from the marketing world, the image feedback generated was superior to US$ 2,7 millions, taking into consideration the advertising numbers provided by the broadcasting station. For the finals, 8 categories had their races transmitted by SPORTV and 11 others were online by streaming. Channel Catve.com also had the Brazilian Karting Championship live for 5 and a half hours. Additionally, on their Facebook profile, they have made the races available On Demand, which has been accessed by 112.000 peolple already. Created less than 90 days ago, the new event’s profiles on social media helped making the difference in promoting the Brazilian Karting Championship. Its presence on Facebook and Instagram provided a much interesting interaction between organizers and drivers. With more than 1.500 followers on each social channel, the #brasileirodekart was mentioned over 1.200 times during the event. More than 50 media professionals asked for event credentials and took it to websites, magazines, newapapers, TV show and even a Karting Annuary that has its launching scheduled for 2018. “I took over CBA Presidency in the third week of March. Among the countless demands of our sport, the first one was to organize a Brazilian Karting Championship that would enter history, that would bring our grassroots category to the same professional level that we see on acclaimed events. In the hands of Pedro Sereno, CNK president, I am very happy for us being able to present a well planned, adjusted and elaborated event. Let us follow our schedule of appreciation of drivers and competitions, and we’ll surely be able to organize even more successful events in a near future.” – said Waldner “Dadai” de Oliveira, CBA President.